The Night Guild controls all crime in the city of Praamis. This brutal organization trains its members from childhood, pushing them through a gauntlet of pain and torment to harden them and make them hungry to steal, to kill, or do what else the Guild requires. Ilanna survived their training. Now five years older from the events of Child of the Night Guild, Ilanna puts all her skills towards one task: protecting her young son. A son the Night Guild doesn’t know about. And she plans on keeping it that way. There’s only one way to do it. She’ll have to buy her way out of the Night Guild. But the Night Guild doesn’t easily let go of useful tools. She will need to pull of a burglary of such prestige, of such wealth, to win her freedom. And Ilanna is nothing if not daring. She has a plan to not only destroy the most dangerous threat to the Night Guild in Praamis but to earn millions. And it will require doing the impossible. Peloquin shifts gears with this book. While the last one was more biopic, following GiRL from the age of seven until her early twenties as she has her ups and downs dealing with her rival, the brutal Sabot, this book is a heist thriller through and through. And with all the grimdark fantasy elements Peloquin is so skilled at balancing. 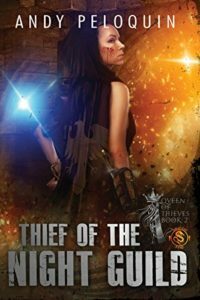 Thief of the Night Guild is a riveting read, keeping you following the intricacies of Ilanna plan as she has to overcome new obstacles, deal with dubious allies, and race against the clock to get everything ready for her window. Because if she doesn’t, more than she will pay the price. Peloquin is swiftly joining my ranks of must-read fantasy authors. You can buy Thief of the Night Guild form Amazon! Excellent review of a superb fantasy series!